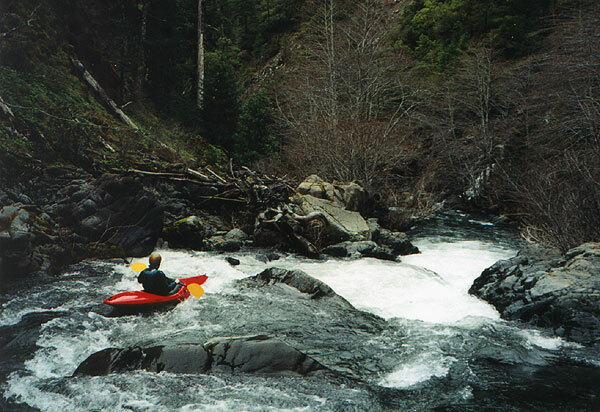 Hurdygurdy Creek is a steep, remote tributary of Northern California's South Fork of the Smith River. Located deep in the rugged Cascade mountains, this creek roars to life only after several days of heavy rain so timing is critical for a good flow. 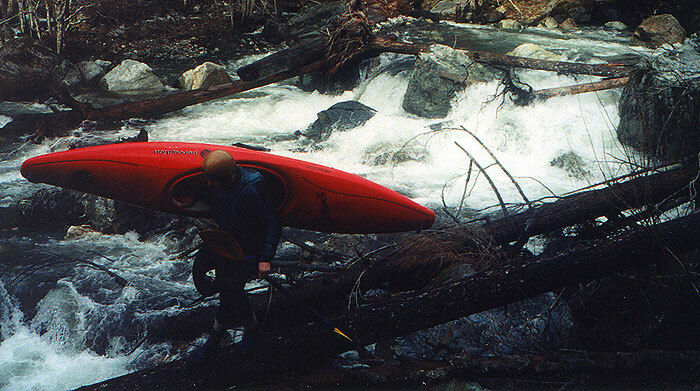 John Whaley and I ran Hurdygurdy on the third and final day of our winter 2000 road trip to California. It was Christmas Eve, and we had just gotten several days of hard rain. Neither of us had done the run before or knew much about it other than the general information provided by the forest service whitewater guide map for the Smiths. We knew that there was a 210 fpm section in the deepest part of the canyon known as 'Devils Gap' but not much else! This is a very remote run, especially the in the steepest part of the canyon. Once boaters enter the Devil's Gap they have no option but to hike downstream if something goes awry- the road swings impossibly far away from here to the other side of Gordon Mountain, so come prepared for anything! 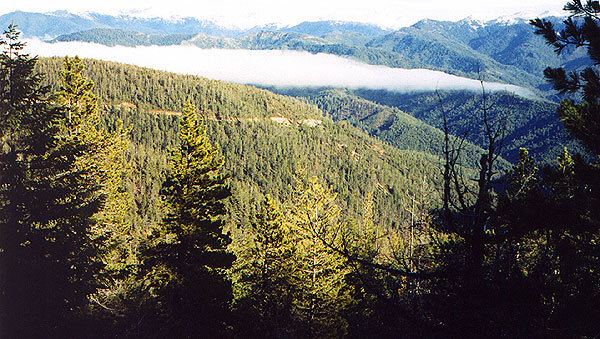 The view down into Hurdygurdy Canyon from Big Flat Road access road. The road visible on the side of the ridge is Bear Basin, which provides access to the headwaters of Hurdygurdy. The cloud hangs directly over Hurdygurdy Creek... No hiking out on this one! We drove up the night before to figure out the shuttle and hike the boats in. We found the access road without too much trouble but were surprised to find it blocked about a mile down, forcing us to carry our boats a little over a mile. It was raining pretty hard and we weren't dressed for it, so we both got pretty well soaked. Once past the road blockage the gravel road quickly deteriorated into forest with only the slightest traces of it's existance in most places. One of the forks of Hurdygurdy gurgled along next to us as we hiked down through the trees and brush into the growing darkness. The map showed a confluence of numerous tributaries forming the main stem of Hurdy about a mile down, and eventually we found it. We came to a big clearing with the remnants of a log bridge across another tributary blocking the path. All that remained of this bridge were two logs, which required a dicey balancing act across the stream rushing past ten feet below. We continued down the trace of a road to a second washout and hiked a hundred feet down this sidestream to the main stem where we hid our boats. That night we camped at Dry Lake, which is about two miles upstream of the take out bridge. (There was also a very nice campsite at the put in we could have used.) In the morning we shook the ice off of our gear and did the shuttle, leaving my car at the take out and proceeding up to the take out at a snails pace on the icy road over Gordon Mountain. We got to the put in and John whipped out a cheesy set of Uvex ski goggles. "For the brush!" he proclaimed, strapping them on while I laughed. Up this high Hurdy was indeed brushy, and we were a little concerned. The creek was only about ten feet wide and looking downstream there was plenty of overhanging brush and limbs to give us trouble. "We'd better be careful on this one." John said grimly as we got in our boats. 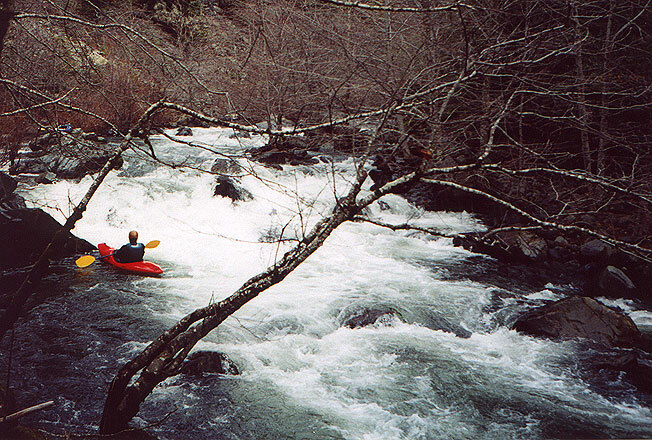 I peeled out and found that John's instincts were right as usual- the creek dropped away through narrow rapids with branches two feet off of the water. After getting my paddle tangled up several times in the branches I started carrying it like a spear through the drops, steering with my hands. Soon the old growth logs started piling up and we started portaging. After our second portage we were both pretty well disgusted, and we began to suspect that something was wrong. Soon the rock walls started to rise out of the water and it looked like we were headed into a serious gorge. "Finally" John said. "I've had enough of this brush." Ahead the creek dropped out of sight over an eight foot ledge and our spirits rose- this was more like it! (We later named this 'Goon Falls', you'll see why...) We ran the ledge and I led as we dropped deeper into the gorge. Suddenly the current accelerated and I found myself clawing my boat into a tiny eddy along the rock wall just above a killer log sieve. The gorge had narrowed down even further, and the creek was now less than ten feet wide with vertical walls on either side. "Jesus Christ" I muttered. "This is @#$ dangerous." I signaled John to stop and we both eased out of our boats and traversed along the wall, climbing over the logjam. Redefining 'Last Chance Eddy' in the Goon Gorge. Well, we were very pleased that the wood and brush was gone as Hurdy was much wider- 20-30 feet in most places. However, after about a quarter of a mile I began to voice my worst fears: "Well, if we put in on the West Fork, then what if we missed the Devil's Gap?" I asked John. 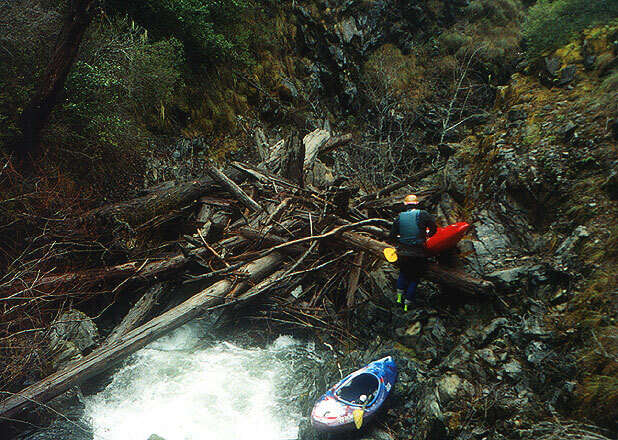 "We could have paddled right past the good stuff- what if it was all above the confluence?" My answer came soon enough, as the creek started to steepen dramatically and the boulder gardens started in earnest. We scouted one steep drop and then encountered a boulder ledge just downstream that had a very burly change-your-religion kind of hole which we boofed over on the right. (and out of sight) is the rapid containing the most gnarly hole on this creek. Below here the creek dropped away and we entered the Devil's Gap. For the next three miles the gradient averaged 170 fpm and it was more or less one big rapid. We gleefully tore through one steep, complex boulder garden after another as most of them were boat scoutable, and somewhere in here I began to have a great time! All of those laps on the Miracle Mile paid big dividends on this creek- connoisseurs of the mile will shred the Devil's Gap! Hurdygurdy was very similar in nature to the upper NFMF; long, complex boulder gardens that were 98% wood free with big, soft holes and classic moves. This was some sweet class V creekboating! John cruising one steep, classic boulder garden after another in the Devil's Gap. This photo doesn't do justice to how steep these drops are- I was standing on a very large boulder 15 feet above the creek when I took this shot! By the end of the three mile steep section I was loving this creek- it was definitely worth all of the trouble! The steep stuff ended abruptly where a landslide came in on the left side resulting in a log-choked mess that we quickly portaged. John portages the log-choked drop formed by a landslide below Devil's Gap. Soon the take out bridge came into sight and we loaded the car and headed home for the holidays- what a great way to end our road trip! 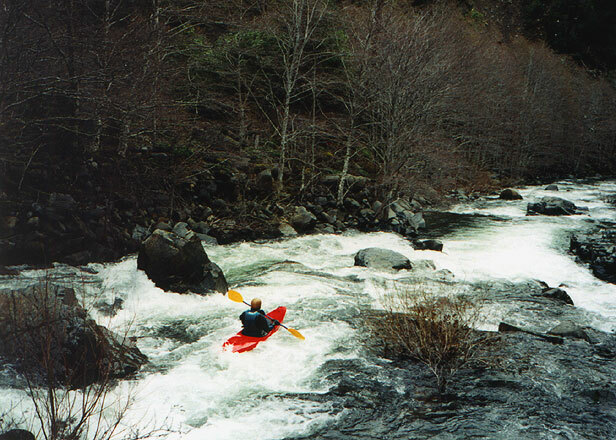 Having enough water is critical on this run as all of the drops consist of wide, steep boulder gardens. Also, if you go up there without adequate flows the last three miles of class III will be pure misery! We had two days of heavy rain before we did this run, and this proved critical. 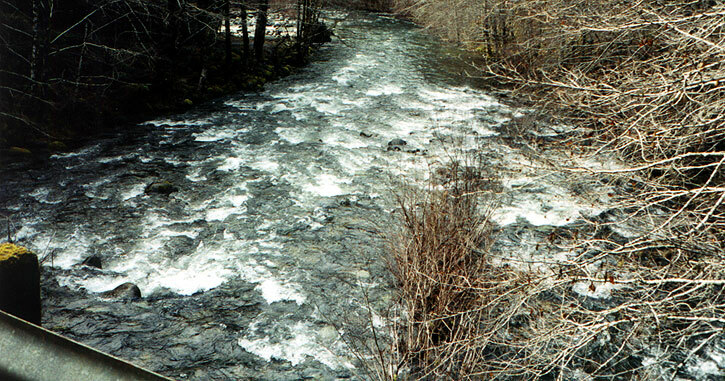 Look downstream from the take out bridge at the shoal just downstream. If you can get through this shoal without touching a rock you have enough water. If it looks very shallow and scrapy don't say I didn't warn you! If there isn't any shoal, just big surf waves, you are going to have a very exciting day indeed! This is a picture looking downstream at the aforementioned shoal from the take out bridge. If you don't have at least this much water don't bother! From South Fork Road turn north on Big Flat Road (a very well maintained gravel road) and drive three miles up to the bridge over Hurdygurdy. This is the take out. From here, drive up past Dry Lake (on the left). The road will fork twice, stay right both times. Soon the road will get very steep, but it is well maintained so no worries. You will top out on Gordon Mountain (great views!) which will give you a chance to contemplate how remote this run is. After about ten miles you will reach Bear Basin Road, going off to the right (there is a sign facing the other way) drive down this road about four miles until you come to a very wide open unmistakeable four way intersection. The access road along the West Fork goes off to the right. Depending on what kind of vehicle you have you can drive down this road about a mile, after which you will have to hike on the remnants of the road for a little over a mile. This is a very easy hike- all flat or slightly downhill. (You can also access this run from the north. From Grants Pass, drive 65 miles west on Hwy 199 until you see the Wagon Wheel motel/cafe on the right hand side of the road. Directly across from the Wagon Wheel is French Hill Road. Turn left, and it is about 10 miles until you come to Bear Basin road from here on a very well maintained gravel road. Big Flat Road and French Hill Road meet at Bear Basin Road.) John has consulted the map and has determined that it is possible to put in three miles higher on Hurdygurdy, but there isn't much gradient up there and it would likely be small and brushy. If you do go up there before I do let me know how it goes! Your biggest decision will come when you get to the Two Log Bridge. First of all, if you do decide to run the West Fork DO NOT put in above the Two Log Bridge tributary! Just above where this tributary comes in to the West Fork is the ruins of a log bridge that has formed a lethal sieve that will probably be there until the end of time. Your best option is to hike another two hundred yards along the old road to where a 15 foot deep wash has formed and do the easy 100 foot hike down the wash to the West Fork. 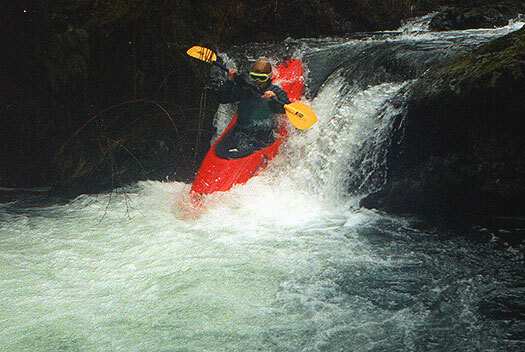 We had about 50 cfs when we put in on this tributary to Hurdy- any more and the Goon Gorge would have been extremely dangerous- think long and hard about putting in here if the water is high!